Virginia's Northern Neck, a peninsula nestled between the Potomac and the Rappahannock Rivers, embodies the spirit of the Chesapeake Bay area and the Northern Neck HookTM Bracelet is a tribute in precious metals to that spirit. With historic villages and farms meandering down to water's edge, the Northern Neck of Virginia has a rich history of bonding man to the land and water and The Northern Neck HookTM conveys that connection with a stylized "N" squared, that is joined to a "V" by the Blue Crab, a resident symbol of the bay. The two solid 14 karat wraps represent the Potomac and the Rappahannock rivers that border the "Garden of Virginia" to the North and South. 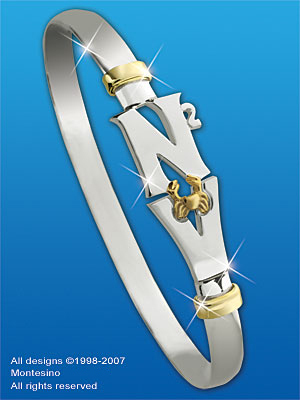 Timeless appeal and rural charm is honored by the Northern Neck HookTM Bracelet, a true symbolic treasure!